Buying too many clothes can seriously ding the family budget. The average family of four spends around $1,600 a year on clothing. That is a sobering statistic when you contrast how much men spend on clothing annually. As the head of the household or one of them, you must set a budgeting example for your family. If you aren’t vigilant, you could be spending more on collecting clothing than on the family budget. Here’s how to determine how many clothes you really need and what to do about it. Men vs. Women: How Many Clothes Do You Really Need? The average American male spends about $85 a month on clothing. Or about $1,000 a year. The average female spends about $75 a month on clothing, accounting for a ten-dollar monthly difference. When all is said and done, it is men who are the real shopaholics. However, this is not a tenable, or affordable, mindset to have for men looking out for the financial needs of their families. Take into consideration the weather environment where you live. Consider your working and home life. Strategize outfits for job interviews and special occasions. Then you can assess how many outfits you need plus assorted accessories for those outfits. No two men are alike, so carefully assess your needs. You only need as many clothes as will fit into a moderately sized closet and drawers – with room to spare. Prioritize your accumulated clothing according to need over want. You may have clothing you’ve worn once or never worn. Wanting them is not a good excuse to keep them. Filter out all unnecessary clothing until you have a manageable-sized wardrobe. People throw away an average of 65 to 85 pounds of clothing a year. If you’ve accepted that you have too many clothes, throwing them away would be a waste. First, have a yard sale. Post clothing for sale on online auction sites. Sell clothing to vintage clothing stores and swap meets. Donate what you can’t sell to churches, charities, and people in need you may know. Embrace a minimalist mindset when it comes to clothing. The things you own, end up owning you. You may spend exorbitant amounts of time sorting, ironing, cleaning, and storing clothing. Unused clothing frays and falls apart over time. Or becomes habitats for pests. Make your home family friendly instead of storage friendly. Once you downsize, don’t start the shopaholic cycle again. You and your family deserve that freedom of space. Downsizing your wardrobe can lead to considerable laundry savings. A washing machine and dryer can cost $700 or more. The average family spends over $600 annually on laundry costs. The more clothes you own, the more time and money you will spend to wash them. Clothing makes the man. Excessive clothing piles make the hoarder. You deserve more out of life than perpetually managing and storing clothes. Your family deserves more time with you. So how many clothes do you need? That depends on what you want out of life. 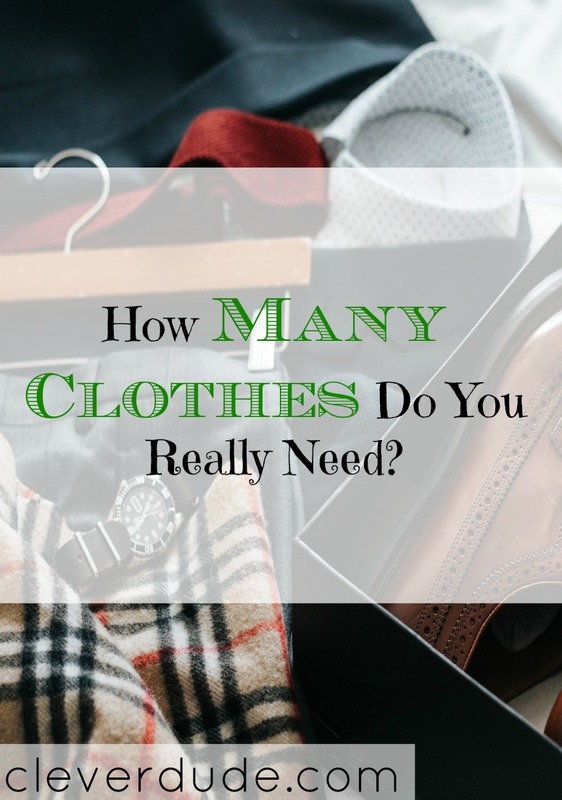 How many clothes do you think a person needs? Let us know in the comments below!